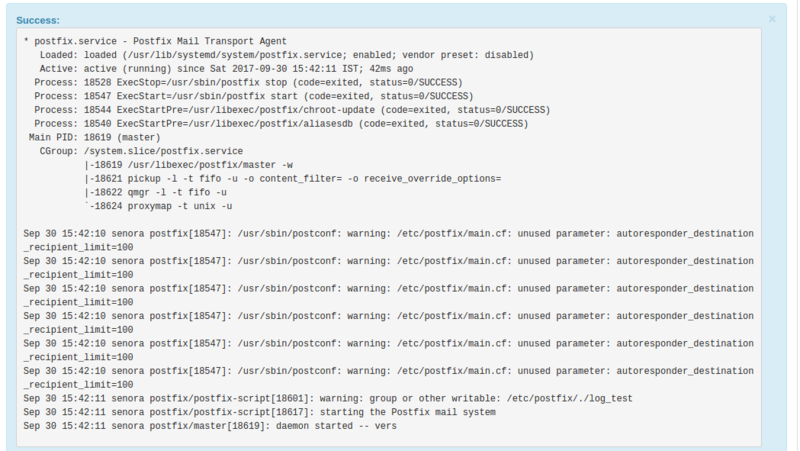 The interface of the service status module looks like below image. What are the services included…? Aweb serveris a computer system that processes requests via HTTP, the basic network protocol used to distribute information on the World Wide Web. The term can refer to the entire system, or specifically to the software that accepts and supervises the HTTP requests. In computing, the Post Office Protocol (POP) is an application-layer Internet standard protocol used by local email clients to retrieve email from a remote server over a TCP/IP connection.POP has been developed through several versions, with version 3 (POP3) being the last standard in common use before largely being made obsolete by the more advanced IMAP as well as webmail. The Internet Message Access Protocol (IMAP) is a mail protocol used for accessing email on a remote web server from a local client. A name server is a computer hardware or software server that implements a network service for providing responses to queries against a directory service. It translates an often humanly meaningful, text-based identifier to a system-internal, often numeric identification or addressing component. The above mentioned services in a single click. It even shows the information about server up time. When clicked on restart server once it completes it shows the log of the server. The success in the above refers to the successful request to restart the service.It its not successfully restarted the service.The status of the restart can be found by the log itself. As per the above mentioned way the services can be restarted in a simple way. Get the web hosting India plans from HostingRaja today!